The Coventry Group was started back in 1980 by Dave and Margaret Gleed and Dave and Maria Lewis. A discussion over a beer a few months earlier was the catalyst for it all. (A younger version of Dave and Margaret is shown in the picture below !! 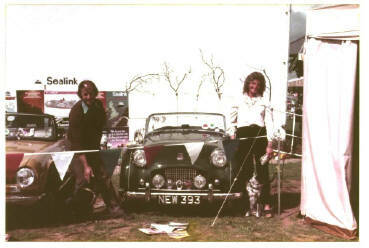 This was taken at the Town & Country Festival in 1982, and neither they, or the car, has aged at all). The 2 Dave's (and of course Margaret and Maria) had long considered trying to get a group of like minded TR people all together in Coventry, and it finally happened when Margaret set a meeting date, a venue (The Standard Triumph Club) and put an advert in the local paper. They reckoned on about 15 to 20 people turning up, so booked a small room. When over 80 people arrived, the whole gathering quickly relocated to a larger room ! Dave Gleed took the responsibility of being Group Leader, (as Dave Lewis was still spending a lot of time at sea) and the rest is history as they say. Dave L finally ended his seafaring in 1990, and became Group Leader in 1994. We meet on the last Wednesday of every month, at the Abbey Club, Kenilworth.